Below is a listing of frequently asked questions we received about our iPhone apps. Hopefully some of your questions are addressed below. How Do I Update my iPhone App? How To Reinstall an iPhone App if it Crashes? Where are my app's settings? Can I Install iPhone Apps on my old iPod or on a non iPhone/iPod Touch? How Do I Find My iPhone ID? There are two ways to check to see if application updates are available for your iPhone. One way is directly on your iPhone or iPod Touch and the other way is via iTunes on your computer's desktop. To check for application updates on your iPhone or iPod Touch, click on the blue 1 "App Store" icon located on your home screen of your iPhone or iPod Touch. 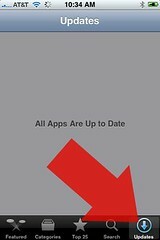 Then click on the 2 "Updates" button at the bottom right of the App Store. To check for application updates on iTunes, open iTunes on your computer and click on 3 "Applicatons" on the left and then click on 4 "Check for updates" at the bottom right of the Applications screen. Open iTunes, click on "Applications" on the left (under your music library). Find the application in the list of apps you have. Right click on it and remove it by selecting delete. Then select "remove" from the alert. Then select "Move to Trash" from the alert. Then sync your iPhone. 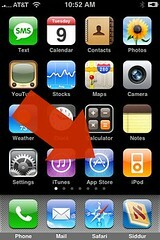 After it syncs, make sure the app is no longer on your iPhone. Then go to iTunes, download the application again (don't worry, Apple will not charge you again if you use the same iTunes account). 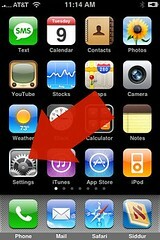 Many apps store the app's settings in the main "Settings" icon on the iPhone's home screen. Click on the grey settings icon and scroll down the list of apps at the bottom of the settings page. Then click on the app's name within settings to manage the settings for that app. 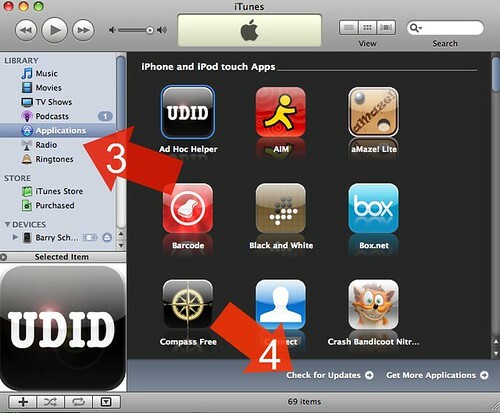 (1) Download a free iPhone app named Ad Hoc Helper and use it to email us your iPhone ID. 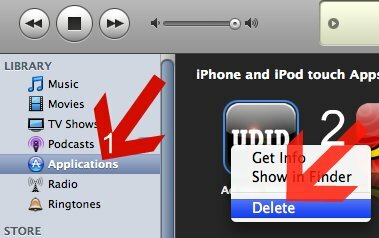 (2) Plug your iPhone into your computer, then open iTunes on your computer, click on the device under the "Devices" section. Then a screen will load with your device's "Summary" tab. At the top of the screen you will see a section that says "Serial Number." Click on it and it will change to "Identifier (UDID)." When it changes, just go to the menu bar at top, click on "Edit" and then select "Copy." This will copy your iPhone ID into your computer's memory. Then paste (control V or menu paste) the ID into your email and send it back to us. Just email us at our contact us form and we will respond asap!